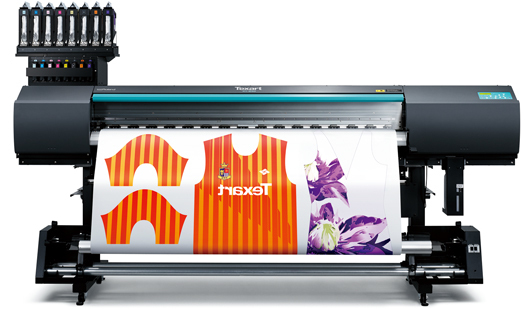 The advanced Texart XT-640 dye sublimation transfer printer maximizes outstanding productivity, exceptional print quality and renowned reliability to achieve optimum results for a wide range of textile applications, including sports apparel, fashion apparel, soft signage and more. The XT-640 is built to deliver the highest level of performance available to meet the demanding requirements of the textile industry. It features dual print heads in a staggered formation to achieve high-speed performance at a usable print speed of 41m2/h. Its reinforced rail, grid roller, and frame provide a firm foundation for smooth operation and exceptional print quality. To capture every gradation and detail in your design, each head fires precise droplets in seven different sizes to accommodate media characteristics and desired print quality. The Roland Ink System ensures stable, long-run printing from one-liter, airtight-sealed pouches. In four-color mode, the system provides two liters per color. The proprietary Roland Ink Switching System automatically switches to the backup ink pouch when the primary pouch runs out. Further expediting production, you can replace an empty pouch on the fly without stopping the printer. Optimized fan absorption power keeps transfer paper flat for printing. A new, more convenient Feed Adjuster at the front and back of the printer provides even tensioning and prevents skewing of the media resulting in a precisely wound roll on the take-up reel for smooth transition to the heat transfer process. The Texart XT-640 yields a marked difference to the colors and quality of your sublimated fabrics. The XT-640’s advanced print control technology in combination with Texart ink produces beautifully sharp images quality with brilliant color. In addition to a four-color mode with fine details and superb contrast, there is an eight-color mode for exceptionally wide color gamut, flawless photographic reproduction, smooth gradations and delicate skin tones. Roland DG’s Texart ink used in the XT-640 dye sublimation transfer printer meets the requirements of Oeko-Tex® Standard 100, class I, which is the most difficult certification in the class. Oeko-Tex® Standard 100 is a global uniform testing and certification system for textile raw materials, intermediate and end products at all stages of production with the aim of completely eliminating harmful substances. Exclusive stands, Power cord, Media clamps, Media holder, Replacement blade for separating knife, Software RIP, User’s Manual, etc.